Ooh 5th of March. My birthday is on the 8th, excellent timing. Then I shall be going to austrai on march 8th. You want to come with me to the cinema on my birthday? We can watch Alice on wonderland. O O O Me too. I’d rather watch the movie with you two then alone. I watched the preview in 3D (before Avatar), and OMG I am freaking out much more than I was before. I was a little irritated at the thought of it being a sequel, but now I don’t care and I am sure I will enjoy it. Sounds good, now you got me even more excited as well. At first I thought I disapproved of it being a sequel but I actually don’t care about these things. I’ll take it as it is and judge from there. 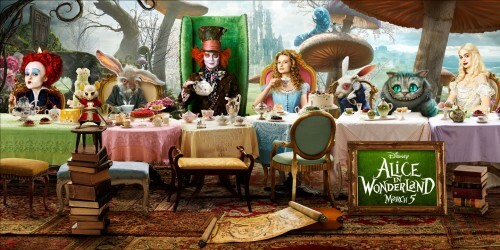 I think I’m the only person on this planet not interested in Alice in Wonderland. The original bored me but didn’t really spring any negative emotions in me, this remake kind of makes me nauseous though. May still give it a go, but I certainly won’t pay for it.